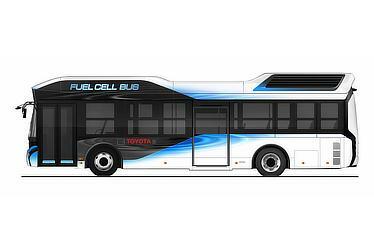 Toyota City, Japan, October 20, 2016―Toyota Motor Corporation will begin to sell fuel cell buses (FC buses) under the Toyota brand from early 2017. 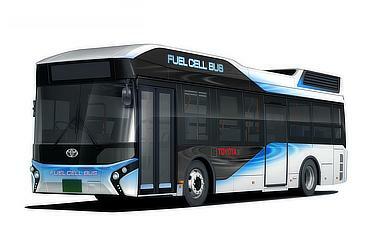 Having already undergone repeated field tests for practical use, the Bureau of Transportation of the Tokyo Metropolitan Government plans to utilize two of these FC buses (model name: Toyota FC Bus) as fixed-route buses. Toyota plans to introduce over 100 FC buses mainly in the Tokyo area, ahead of the Tokyo 2020 Olympic and Paralympic Games. In view of this, the FC buses will be sold for the first time in Japan in early 2017, so as to help increase the level of understanding by the general public of the utilization of FC buses as a form of public transportation. Moreover, in preparation for the Tokyo 2020 Olympic and Paralympic Games, the number of FC buses being introduced will increase steadily going forward. Together with this, Toyota aims to engage continuously in the diligent development targeted at the expansion of the introduction of the new FC buses from 2018 so as to contribute to the realization of a hydrogen-based society. The Toyota FC Bus was developed by Toyota, based on the company's experience in developing FC buses together with Hino Motors, Ltd. (Hino). The Toyota Fuel Cell System (TFCS)1, which was developed for the Mirai fuel cell vehicle (FCV), has been adopted to provide better energy efficiency in comparison with internal combustion engines, as well as to deliver superior environmental performance with no CO2 emissions or substances of concern (SOCs) when driving. The bus also uses a high-capacity external power supply system. With a power supply capable of a 9 kW2 maximum output, and a large capacity of electricity supply at 235 kWh3, the FC bus can be used as a power source in the event of disasters, such as at evacuation sites such as in school gymnasiums4 or, its electricity supply can also be harnessed for home electric appliance use. The Toyota Group considers the use of hydrogen to be a powerful source of energy for the future. Toyota has released the Mirai FCV, while also engaging in the technological and product development of FC buses, fuel cell forklifts, as well as stationary fuel cells for use in homes. Going forward, the group will accelerate developments in a unified manner, so as to contribute to the realization of a hydrogen-based society. 1A system combining hybrid technology with fuel cell technology composed of Toyota FC stacks and high pressure hydrogen tanks etc. 2Possible electric power varies depending on the performance of the power supply unit. 3After DC/AC conversion by power supply unit. Power supply capacity varies according to power supply unit conversion efficiency, amount of remaining hydrogen and power consumption. 4Requires wiring work at the facilities.